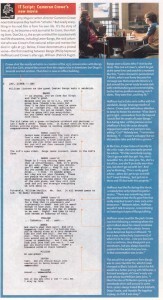 One early version of the script was entitled The Journalist. The roles of Russell Hammond and Penny Lane were originally offered to Brad Pitt and Sarah Polley, respectively. 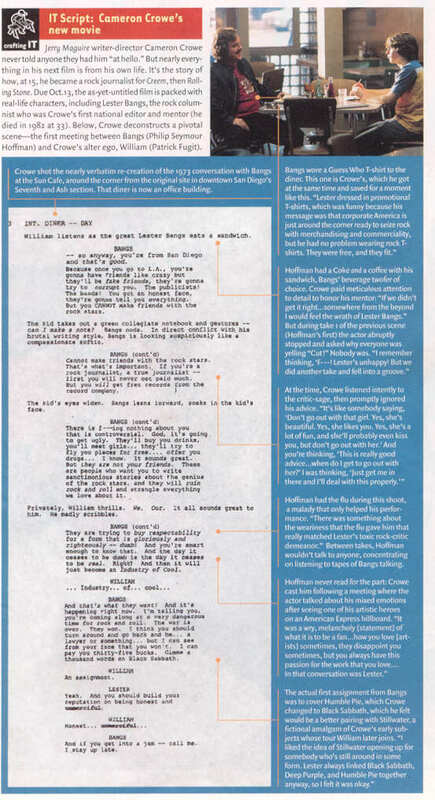 Pitt left the project because he didn’t feel he understood the character, while Polley couldn’t commit because of other projects. Philip Seymour Hoffman (Lester Bangs) was only available for four days of shooting. During all four days, the actor was nursing a bad cold. Photographers Joel Bernstein, Neal Preston and Jim Marshall were used to find shots from the era. A few of Bernstein’s photos that he used for Neil Young’s album jackets were re-created almost exactly for the movie. These include the gatefold image of Young and his fellow musicians from After the Gold Rush, and the crowd shot from the live album Time Fades Away. Some scenes were shot at Los Angeles’ historic Ambassador Hotel. Since opening in 1921, the hotel has always been closely tied to Hollywood. Joan Crawford, Merv Griffin and Bing Crosby were discovered at the grounds’ ever-popular Cocoanut Grove nightclub. It was also the infamous site of Robert Kennedy’s assassination in 1968.The memorable scene in The Graduate where Benjamin meets Mrs. Robinson in a hotel was filmed in the Ambassador’s lobby. The hotel’s last guests checked out in 1989. During the opening credits, the hand that’s writing on the notepad belongs to Cameron. Here’s the list of LP’s young William flips through (in order): the Beach Boys’ Pet Sounds; Big Brother and the Holding Company’s Cheap Thrills; Joni Mitchell’s Blue, Cream’s Wheels of Fire; Crosby, Stills and Nash; Bob Dylan’s Blonde on Blonde; Simon and Garfunkel’s Bookends; The Who Sell Out; JFK Memorial Album; the Moody Blues’ Days of Future Passed; Jethro Tull’s Stand Up; the Jimi Hendrix Experience’s Axis: Bold as Love; the Supremes’ Greatest Hits; and the Who’s Tommy. In the scene where the tour plane hits turbulence, Russell starts to sing “Peggy Sue.” This is in reference to Buddy Holly, who died in a plane crash while on tour. Penny Lane is based on many groupies or “band aids” that Cameron got to know during the ’70s, but the main inspiration is a Pennie Trumbull. You can check out her official site here. Patrick Fugit, grew three inches during filming, resulting in multiple costume refits. Near the end of filming, costar Billy Crudup had to wear platform shoes to ensure continuity. Fugit’s voice also changed during the film’s shoot. Alice Crowe (Cameron’s mom) appears in the graduation scene as a teacher handing out diplomas. Rolling Stone chief Jann Wenner makes a cameo appearance as the man William sees in the taxi. 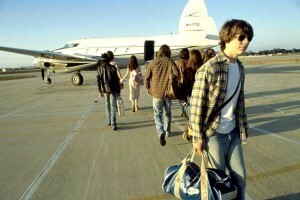 Almost Famous had its world premiere at the 25th Toronto International Film Festival on September 8, 2000. 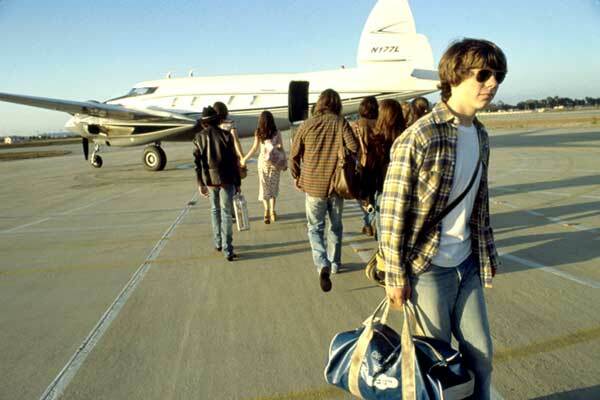 Almost Famous also opened up the 44th London Film Festival on November 1, 2000.